Research for the common good has at its core a genuine thrive to benefit impoverished and disenfranchised sectors of society. What's the value of research? One could argue that research has a value in and of itself. This may be true. Shouldn't we think about how our research affects those we are researching? 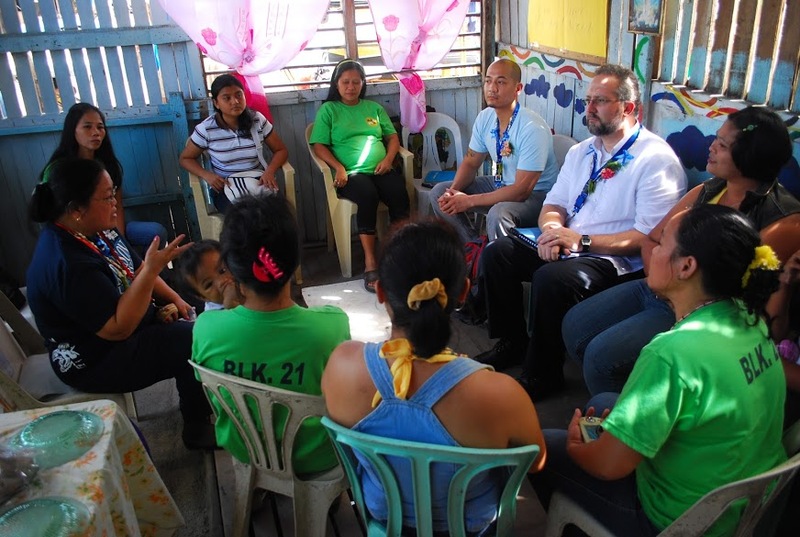 Research can also be a valuable tool used to improve the lives of impoverished communities. Research, when engaged, participatory and community-based can find sustainable solutions to global problems like world poverty. It can be directed toward making the world a better place while supported by methods and praxis (theory and practice together) that can be used as positive agents for transforming lives and communities alike. Most often, research is reviewed by boards in academic institutions that make sure research "does no harm" to individuals or animals (especially the most vulnerable ones). But much less effort is placed on directing and evaluating research on its social responsibility "to do good". I left Harvard with no real awareness of the awful inequities in the world – the appalling disparities of health, and wealth, and opportunity that condemns millions of people to lives of despair. I learned a lot here at Harvard about new ideas in economics and politics. I got great exposure to the advances being made in the sciences. But humanity’s greatest advances are not in its discoveries – but in how those discoveries are applied to reduce inequity. Whether through democracy, strong public education, quality health care, or broad economic opportunity – reducing inequity is the highest human achievement. I left campus knowing little about the millions of young people cheated out of educational opportunities here in this country. And I knew nothing about the millions of people living in unspeakable poverty and disease in developing countries. It took me decades to find out (Gates, 2007). ​The 4P Principles is a model for ethical discernment Dr. Tavanti created during his work as Fellow of the Center for Business and Professional Ethics at DePaul University. The principles emerged from his previous research in developing the Value-Based Leadership model for the Hay-Vincent on Leadership Project. It was later incorporated in the University Initiative Ethics Across the Curricula lead by Dr. Patricia Werhane and shared in the Ethics 101 booklet. Later, this model with its principle of solidarity, subsidiarity, sustainability and synchronicity was incorporated into the Management Exercises. Solidarity is a founding principle in value-based ethical decision making rooted in Catholic Social Teaching (CST). Several contemporary ethicists agree that a feasible ethic for today’s globalized society must be relational. It must be an ethic of solidarity. Pope John Paul II was a strong promoter of the solidarity principle and actively supported the Polish Solidarity Union (Solidarność). In his letter encyclical Solicitudo Rei Socialis, Pope John Paul II, identifies the concept of solidarity with the poor and marginalized as a constitutive element of the Gospel and human participation in the common good. He describes this virtue as "a firm and persevering determination to commit oneself to the common good; that is to say to the good of all and of each individual, because we are all really responsible for all". Subsidiarity is the notion that a central authority should perform only those tasks that cannot be performed effectively at a more immediate or local level. Larger and more complex organizations should respect and promote those operations and decisions that can be done as well by a smaller and simpler organization. Any activity that can be performed by a more decentralized entity should be respected and promoted. “According to the logic of subsidiarity, the higher Authority offers its subsidium, that is, its aid, only when individual, social or financial actors are intrinsically deficient in capacity, or cannot manage by themselves to do what is required of them”. Subsidiarity is the opposite of fascism and a safeguard for limited government and personal freedom. 3. The Principle of SustainabilityThe groundbreaking Brundtland Report, Our Common Future, defined sustainability as “meeting the needs of the present generation without compromising the ability of future generations to meet their own needs”. It suggests what leadership works and decisions should take into consideration on three fronts: economic, social, and environmental impacts. Each need must be integrated and equally considered in leadership decision-making and ethical plans of organizations. Personal impulses for charity or unorganized collective efforts are not enough to make a sustainable impact in society and on the lives of the poor. 4. The Principle of SynchronicityThis principle is based closely on the notion of working for a higher purpose in life. It is about developing a spiritual intelligence and a humbling awareness that people, leaders, organizations, and institutions are not here forever. It requires a discernment for vocation to serve and a spiritual intelligence to nurture our values. Synchronicity is about rediscovering the inner path of leadership. I have been involved and supporting the Principles of Responsible Management Education (PRME) emerged from the United Nations Global Compact (UNGC). 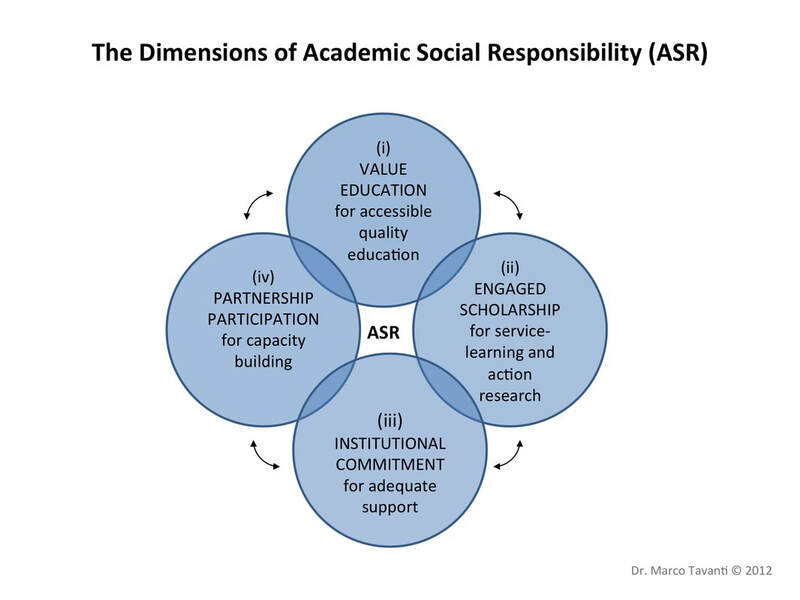 Though quite basic in themselves, the Principles represent a movement in academia (research, teaching, service and administration) that reflects the value of academic social responsibility (ASR), or as the United Nations Academic Impact (UNAI) prefers to call it, Intellectual Social Responsibility (IRS). Dr. Jeffrey Sachs and UN Millennium Campaign in support of the Millennium Development Goals (MDGs) emphasize that working toward the most pressing world problems, especially alleviating poverty, is the most pressing social responsibility of our generation. For the first time in human history, our generation has the knowledge, capacity and responsibility to halve extreme poverty by 2015 and end it by 2025 What is the responsibility of academia in this challenge? Today, PRME represents a growing movement of academic institutions and management programs committed to the promotion and integration of socially responsible principles and practices. They represent a platform for dialogue and implementation of social responsibility in education and for making management education relevant to local and global poverty reduction and sustainable development. Social responsibility and sustain-ability are not a fashion in management education. They reflect fundamental shifts in our societies and economic systems that will develop in the years to come. The PRME offer an engagement model for management schools and academic institutions who want to stay “ahead of the curve” by integrating sustainability and social responsibility into their learning outcomes and programs. Read more in Dr. Tavanti's Responsible Management Education in Practice: The Principles and Processes for Educating Socially Responsible and World Engaged Leaders. If you would like to know more about practical notions and model for Academic Social Responsibility (ASR) check the World Engagement Institute's Academic Centered Methods. There are various studies in the separate treatment of “human rights” and “sustainable development”. 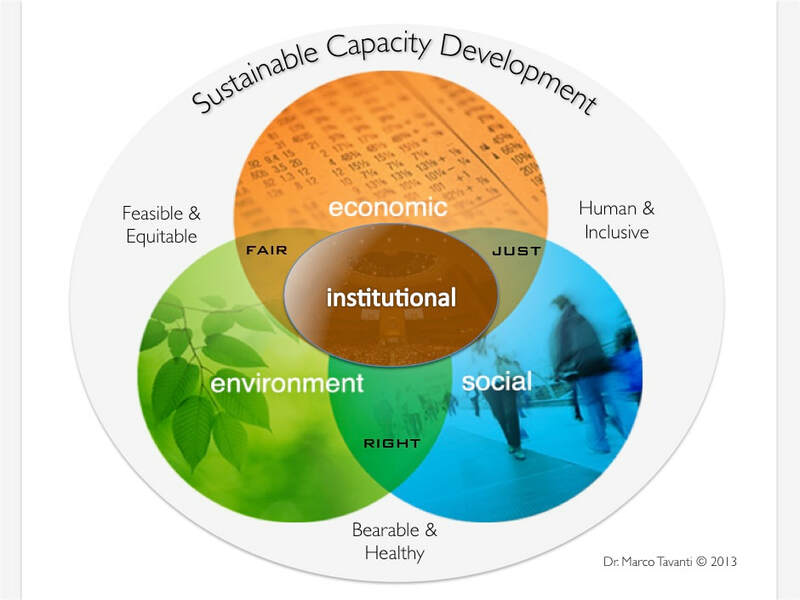 However, as public policy makers (at the national and international levels) feel the intense pressure from civil society: (a) to do something substantive about the quality of our human and natural environments and (b) to establish the proper institutional architecture to sustain the welfare of this and future generations, there is a need to develop a new united conceptual and practical framework to bring these two themes together. Working with Dr. Alfredo Sfeir-Younis, an internationally renowned scholar and leader in the fields of sustainable development and human rights, we make an argument and a practical framework to merge these two paradigms. To find a united framework which will translate into significant revisions of the ways we conceive both “human rights” and “sustainable development”. To understand this combined approaches we first need to recognize the values and limitations of sustainable development and human rights. Sustainable Development: One prominent definition of sustainable development is from the renowned Brundtland Commission Report (1987). The authors stated that sustainability is attained when we are able to satisfy the needs of the present generation without sacrificing the welfare of future generations. This was one of the first definitions available as an international consensus on the subject. One of the most notable parts of this definition is the recognition of the inter-temporal nature of sustainability. What do we mean by that? They explicitly recognized the existence of future generations. This is to say that our activities in this Planet –production, consumption, trade, servicing, etc. -- must not just respond to the needs of the present generation, ‘us’. They also recognized the importance of long-term development. The idea was not just to observe and measure what may happen in a couple of years from now, but many years ahead of us. This notion of acting today for tomorrow has long been a priority to indigenous peoples. One major limitation of The Brundtland Commission Report definition of sustainability has to do with the concept of “need”. What are the needs that have to be satisfied? Whose needs? Are the needs of the rich equally important to the needs of the poor? The question here is how one defines the concept of need, and what would be the yardstick against which we will measure advances towards sustainability in development. If all depended on private actions and privately held resources, the answer would be very simple: What each society can afford. But when we depend on common resources, earth resources that belong to everyone, the situation is quite complex. This is in addition to the ethical and moral questions that this concept of “needs” and the satisfaction of those needs raise in our human context. There are many other definitions of sustainable development. An easy one to remember is that sustainable development necessitates that development be economically, socially and environmentally sustainable. This was often referred to as the “sustainability triangle” A lot was said about each of the axis of the triangle, but very little was brought about them together. There was no optimization framework that would look into the trade-offs between growth and environment, or any other combination or permutation. Rights-based Development: The goal of a rights-based approach to development is greater realization of rights. A rights-based approach is used in international development and as a method for broad based poverty reduction. Before an intervention is carried out, two groups are identified: 1) The rights-holders. The target group who does not experience fulfillment of rights and 2) The duty-bearers. The institutions who are obliged to fulfill the rights of the rights-holders. Most would consider the mandates by Kofi Annan in 1997 to be the catalyst for infusing human rights into every aspect of the United Nations. 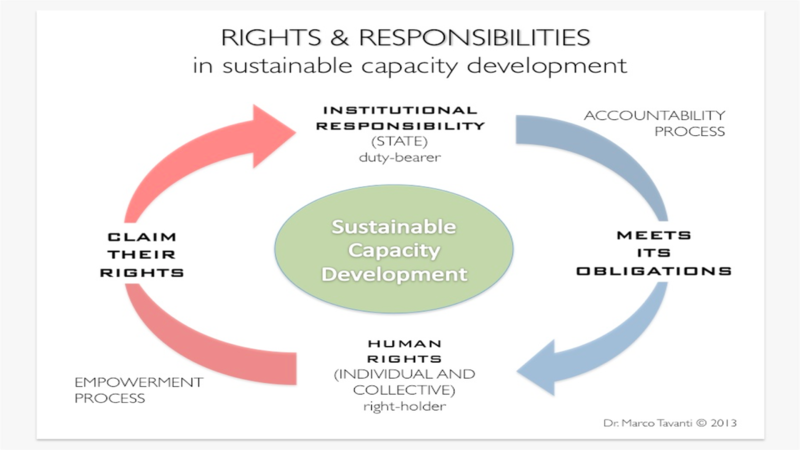 This is most clearly depicted in the UNDP’s policy document “Integrating Human Rights with Sustainable Human Development.” This approach is not new. For most people addressing the debate on human rights and the environment, a sub-sample of declarations, statements or treaties are often in their minds. In particular, one would hear references, for example, on: the Resolution of the General Assembly of the United Nations of 1968, which makes explicit reference to the role of the quality of the human environment on the quality of life of people; the 1972 Declaration of Stockholm, which was a direct result of the First Conference on Development and Environment; the Hague Declaration which makes reference to the linkages between the Right to Life and the quality of the human and natural environment; the General Assembly of the United Nations Declaration in 1990, which said that people are entitled to live in an environment that is healthy and appropriate for their well-being; the Resolution of the Commission on Human Rights specifically on human rights and the environment (first time! ); The Rio Declaration of 1992 which was the result of the Second Conference on Development and Environment; the OECD Declaration as regards the Right To Environment as a fundamental rights (“live in a decent environment”); the United Nations Economic Commission for Europe where the issue of protection of the environment and forests for both the present and future generations. 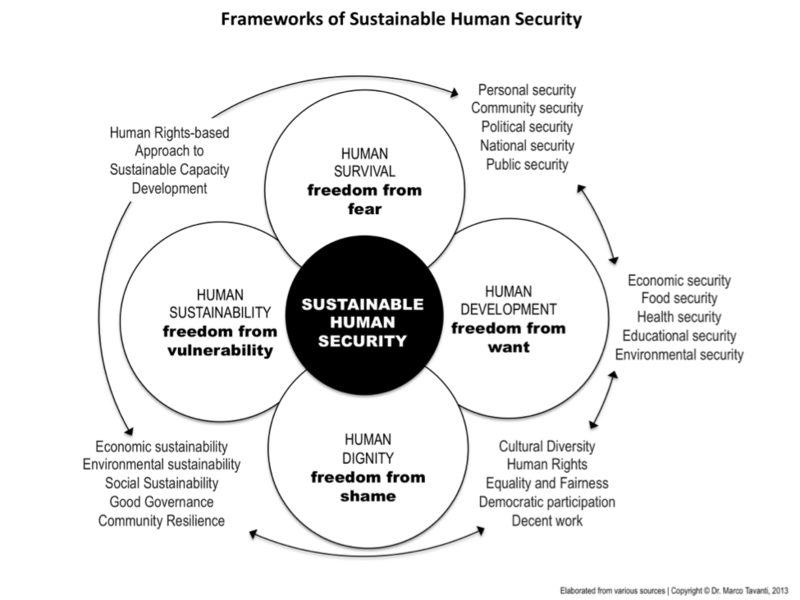 Learn more about human rights based approach to sustainable development here. 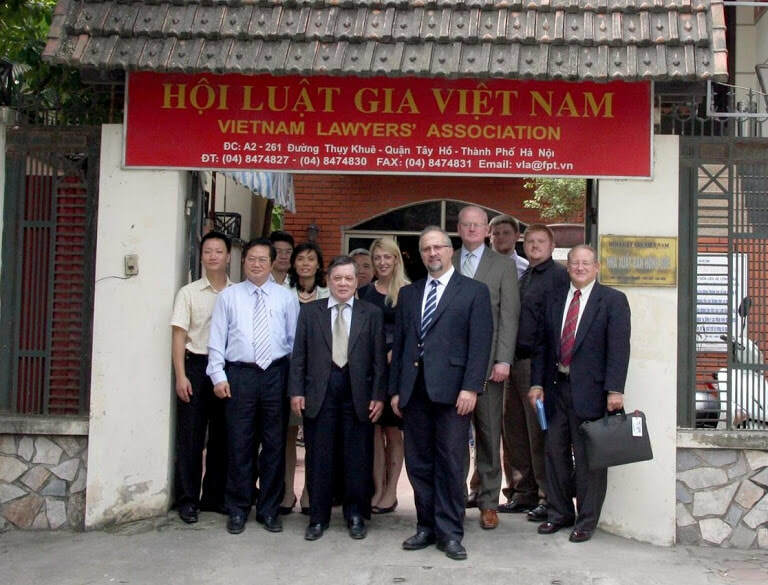 Dr. Tavanti with colleagues of the World Engagement Institute during a fieldwork research for human security and human rights approaches for anti-human trafficking at Vietnam National University in Hanoi, Vietnam. Photo October 2011.